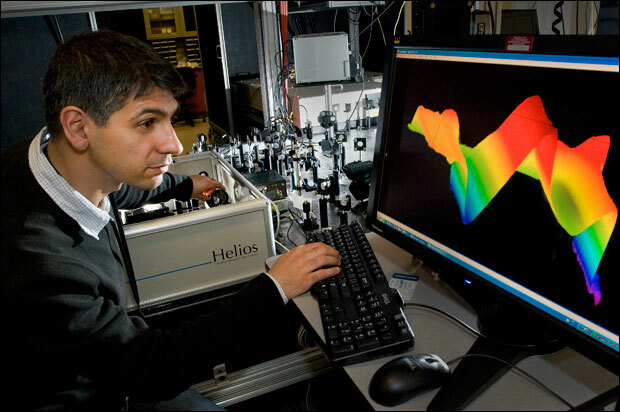 The Advanced Optical Spectroscopy & Microscopy Facility combines a broad range of instruments suitable for the characterization of optical and optoelectronic properties of hard, soft or biological materials using ultrafast pump-probe and nonlinear spectroscopy and microscopy, including single-molecule microscopy. Ultrafast Pump-Probe Transient Absorption Spectroscopy with broadband femtosecond and nanosecond probing covering UV, VIS and NIR regions. Ultrafast Pump-Probe Upconversion Fluorescence Spectroscopy with broadband femtosecond probing in VIS and NIR regions. Time-Resolved Photoluminescence Spectroscopy covering UV, VIS and NIR. Steady State Photoluminescence Spectroscopy covering UV, VIS and NIR. Advanced data analysis methods, including single decay and global fits using a variety of kinetic models, antibunching for single photon sources, fluorescence correlation spectroscopy and burst integrated fluorescence lifetime analysis. Time and Spectrally Resolved Confocal Fluorescence Imaging and Probing with single nanoparticle sensitivity. Time and Spectrally Resolved Electroluminescence Imaging and Probing. Confocal Hyperspectral Dark Field/ Bright Field/Fluorescence Imaging with single nanoparticle sensitivity. Hyperspectral High-Speed Laser Scanning Confocal Fluorescence Imaging. Non-Linear Imaging: Second Harmonic Generation and Two-Photon Photoluminescence. Femto-and Nanosecond Transient Absorption Spectrometer (Ultrafast Systems, Helios, EOS), combined with tunable femtosecond pump pulses from TOPAS OPA. Spectral transients can be recorded with broadband 100 fs (0 - 3 ns range) or 500 ps (0 – 50 ms range) probe pulses in the UV/VIS (370 - 850 nm) or NIR (850 - 1600 nm). Good for: ultrafast kinetics of charge and energy transfer materials, 2D materials, inorganic materials, quantum dots, polymers, proteins. Fluorescence Upconversion Spectrometer (Ultrafast Systems, Halcione), for measuring ultrafast emission processes in the visible and NIR (400 - 1600 nm) with a time resolution of ~ 200 fs over 0 - 3 ns range. Fluorescence Lifetime Spectrometer (Picoquant FT 200) for time-resolved emission probing in UV-VIS-NIR (400-850nm, 950-1450nm). Uses a Hamamatsu microchannel plate-PMT detector for UV-VIS (25 ps response) and a Hamamatsu InGaAs PMT for NIR (400-ps response). Liquid N2 cryostat available for low temperature experiments. Polarization and anisotropy attachments included. Capable of recording fluorescence decays, time-resolved anisotropy and time-resolved emission spectra. Good for: ultrafast kinetics of charge and energy transfer materials, 2D materials, inorganic materials, quantum dots, conductive polymers, proteins, organic dyes. Olympus	IX81 inverted microscope with objective scanning stage, various high NA objective lenses, Si-based single photon counting detectors (400-1100nm range) and InGaAs photon counting detector (900nm-1650nm) for time-resolved PL imaging and probing, including single photon source characterization. Uses an Acton SP2750-Pixis100 spectrograph/CCD system for micro-PL spectroscopy (400-1100nm range). Equipped with a micro-cryostat for low temperature (4.5K) imaging. Available laser excitations are pulsed 442nm, 532nm at various repetition rates. For time and spectrally resolved electroluminescence measurements, a 600 ps impulse current generator is used. Nikon Eclipse T2 inverted microscope with long working distance objectives and laser based LED white light source, Acton SP500-Pixis100 spectrograph/CCD camera (400nm-1100nm) for recording scattering and fluorescence spectra, spectroelectrochemistry attachment, bright field imaging, chirality and polarization modes. Good for: scattering spectra of plasmonic noble metal nanoparticles, confocal absorption spectra of 2D materials, reflectivity measurements, spectroelectrochemistry of plasmonic nanoparticles, photocatalytic plasmonic samples. Leica TCS SP5 commercial inverted laser-scanning confocal fluorescence microscope (video rate) for fluorescence, transmission and reflection imaging (400-800nm range). Capable of FRET, FRAP, FCS, HyperSpectral Imaging, micro PL spectroscopy using CW laser with lines in the 457-632 nm range, FLIM, SHG and Two-Photon Imaging with a MaiTai femtosecond broadband laser (710nm-990nm). Good for: biological sample imaging including cells, quantum dots, proteins. Horiba Nanolog Fluorescence Spectrometer for UV-VIS-NIR (400-1750nm). Records both emission and excitation spectra, 2D emission-excitation maps, stationary anisotropy. Cuvettes and thin film sample support are available. Liquid N2 cryostat available for low temperature experiments. Polarization and anisotropy attachments. Good for: organic and inorganic fluorescent materials, quantum dots, conductive polymers, protein, organic dyes. Home built instrument based on an Olympus IX81 inverted microscope and three lasers (488nm, 561nm, 632nm), long working distance high NA lens, large area scanning, photodetector for reflection imaging. Good for: FET characterization of quantum dots, conductive polymers, 2D materials, carrier diffusion length. The CFN houses a commercial broadband transient absorption spectrometer (Helios, Ultrafast Systems) with approximately 100 fs time resolution in a time window of 0 - 3 ns. In this technique, the samples are optically "pumped" using a tunable (240 - 2600 nm) femtosecond laser pulse and "probed" for changes in transmission using a "white-light" laser generated supercontinuum. The system can be configured to record spectral transients in one of three operating modes: 350 - 700 nm, 450 - 820 nm, or 800 - 1600 nm. Sample holders for cuvettes and thin films are available. In addition, the broadband transient absorption spectrometer can be configured to measure long-lived electronic and chemical species with sub-ns time resolution in a time window of 0 - 50 microseconds (EOS, Ultrafast Systems). In this configuration, spectral transients can be recorded in one of two operating modes: 370 - 900 nm or 800 - 1700 nm. Sample holders for cuvettes and thin films are available. This is an optically gated technique using a femtosecond excitation pulse and a longer (~ 500 ps) white-light laser probe pulse. This is a commercial spectrometer (Halcyine, Ultrafast Systems) capable to measure ultrafast emission processes in the visible and NIR (400 - 1600 nm) with a time resolution of ~ 100 fs in a time window of 0 - 3 ns. In the upconversion method, the emitted photons are mixed with an optical gate pulse in a nonlinear crystal optimized for sum frequency generation. We detect the intensity of the higher energy upconverted photons as a function of time delay between the excitation pulse and the gate pulse to map out the kinetics. Alternatively, spectral emission transients can be recorded at a fixed delay time. This is a commercial spectrometer (Picoquant FT200) capable to measure ultrafast emission processes in the visible and NIR (400 - 1450 nm) with a time resolution of ~ 25 ps in a time window of 0 - 100 microseconds. It uses an ultrafast oscillator (Tsunami Spectra Physics) in combination with a frequency doubler/pulse picker to provide excitation in the 350nm-490nm spectral range at variable repetition rates from 8MHz down to 10 kHz. This allows users to measure both short (10ps and longer) and slow (tens of microseconds) lifetimes. Sample holders for cuvettes, and thin films are available, including a low temperature liquid N2 cryostat. Data analysis software (Fluofit Picoquant) is also available. This is a commercial fluorimeter (Horiba Nanolog) equipped with a 75 W Xe lamp, double substractive monochromators, a PMT for UVVIS (250nm-800nm) and an InGaAs CCD for NIR (850-1650nm) detection. Capable to measure fluorescence excitation and emission spectra, correlated 2D excitation-emission maps, stationary fluorescence anisotropy. Sample holders for cuvettes, and thin films are available, including a low temperature liquid N2 cryostat. This is a CFN manufactured confocal scanning microscope based on a Olympus IX81 inverted microscope with objective scanning capability (80x80 microns), various objective lenses (oil 100x, 1.4NA, water 60x, 1.2NA, air 100x, 0.95NA and 60x, 0.9NA), dual color pulsed excitation (440nm and 532nm lasers from Picoquant), 4 Si-based photon counting detectors (400-1100nm range) for time-resolved two-color and polarization PL imaging, and an Acton SP2750-Pixis100 spectrograph-CCD system for micro-PL spectroscopy (400-1100nm range). Single nanocrystal sensitivity is possible and ready for single photon source characterization. The system is equipped with a liquid He cryostat (4.5K) and can be coupled with a Nanosurf AFM for correlative confocal/AFM imaging. User friendly Picoquant Symphotime 64 software mapping, decay fitting and blinking analysis. User friendly Lightfield data acquisition and analysis software for microspectroscopy. For time and spectrally resolved electroluminescence measurements a 600 ps impulse current generator is used in combination with the microscope. This is a commercial NT&C NanoMicoSpec Nikon Eclipe T2 inverted microscope equipped with a laser driven white light ultrastable LED, a Roper HRS 500/Pixis 100 spectrometer/CCD system for hyperspectral dark field scattering imaging and probing, fluorescence imaging and probing working. Single nanoparticle sensitivity in both scattering and fluorescence modes. Correlated hyperspectral dark field and fluorescence imaging available. Additional modes include bright field imaging, reflectivity spectra, polarization and chirality modes. Equipped with several long working air objective lenses, 4x, 10x, 20x and 60x, automated sample stage imaging and positioning, spectroelectrochemistry and gas chamber for catalytic reaction studies. A EM-CCD Hamamatsu camera can be used for 2D single molecule tracking. A commercial Leica TCS SP5 laser-scanning confocal/multiphoton fluorescence microscope is available for users wishing to perform fast scanning/imaging (video rate) of fluorescent samples. It includes several continuous wave lasers (Ar-ion 457nm, 488nm, 514nm, He Ne 543nm and 632nm) for hyperspectral confocal imaging and a broad band ultrafast Ti:Sapphire oscillator (MaiTai Spectra Physics) for multiphoton and second harmonic imaging microscopies. Leica is equipped with several objective lenses (63x 1.4 NA oil, 63x 1.2 NA water, 20x 0.5NA oil and 10x 0.2 NA air), and uses 3 detectors for up to three color simultaneous imaging (400-800nm range) and two photon counting detectors for two-color FLIM imaging (250 ps resolution) and Fluorescence Correlation Spectroscopy. Various imaging modes are available to the users: Confocal and hyperspectral confocal fluorescence imaging, FLIM, FRET, FRAP, FCS. Extensive, yet user friendly data acquisition and analysis LAS software including 3D reconstruction. This is a CFN manufactured instrument based on an inverted Olympus IX81 microscope equipped with 488nm, 561nm and 632nm lasers, a 50x long working distance objective lens, and with reflection image capability. It offers users with the ability to record photocurrent maps with 400nm resolution with samples usually integrated in a FET format, measure carrier diffusion lengths. FET samples can be built in the CFN clean room facility, including wire bonding.